This isn't some regular biker style boot here. This is a high fashion harness boot by Antonio Zengara. Featuring the metal ring and harness look with the pointy long toe style. These tan color boots have the look down pat for you to get by that goon at the door and into that club. 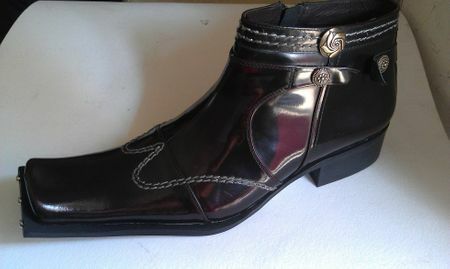 Read More about Antonio Zengara Shoes here. Did you know that ContempoSuits.com also sells Tuxedos too. You should also check out our huge selection of affordable priced Mens Suits. Don't Forget to Check out our selection of Stacy Adams Shoes. Take a walk on the Exotic Skin Side with Real Crocodile Shoes by Belvedere Shoes. Maybe you're shopping for Zoot Suits.